BJR|case reports Editor-in-Chief, Giuseppe Guglielmi, reflects on the first few months of his role on the new journal after publication of its first five articles. 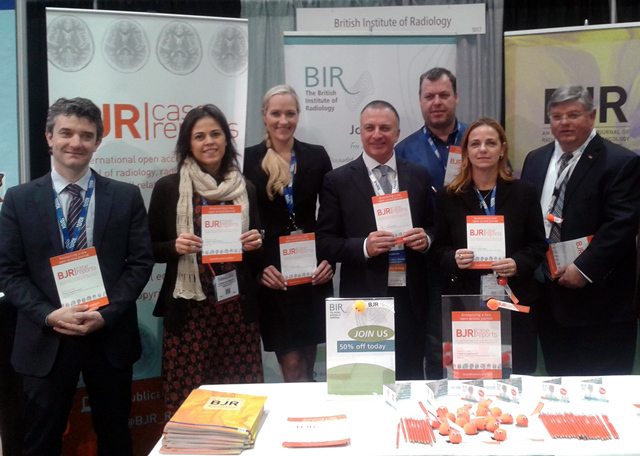 As Editor-in-Chief of BJR|case reports, the initial three months of this new journal have been particularly exciting for me, working with the BIR on its first new journal in 25 years to create a dedicated home for radiological case reports. I have had a long association with the BIR and serve as an Associate Editor on BJR, bringing my editorial experience to this new journal. I believe BJR|case reports represents a fantastic opportunity to young radiologists and scientists starting to venture into scientific publishing, by writing up and submitting their first case report and being able to familiarise themselves with the freely accessible published content. Of particular interest over these last months has been the positive response to the journal launch at RSNA last year (Figure 1). Many researchers, across all levels of experience commented that it is getting harder and harder to find somewhere to publish (and read) case reports relating to radiology, radiotherapy and the related sciences. Since launching in December 2014 BJR|case reports have received over 175 submissions from 25 countries. A significant number of these submissions have come from the United States and India, reflecting the truly international nature of the community. The breadth in subject area of submitted cases has also been interesting to see, with cases received across all major clinical systems and imaging modalities amongst the diagnostic submissions, as well as representation from radiotherapy case reports and medical physics technical notes. I look forward to the exciting times ahead, growing and developing the journal to provide an open resource for novel, original and educational cases reports for the radiology and radiation sciences community. The BIR is committed to the dissemination and re-use of research outputs and as part of the BIR|Open initiative, all BJR|case reports articles will be open access, published under a Creative Commons Attribution licence allowing unrestricted access as well as commercial or non-commercial re-use of content, with proper attribution. If you or any colleagues are currently preparing a case for submission, you can submit here and any editorial queries about the journal can be directed to bjrcroffice@bir.org.uk. As an introductory offer article publication charges are being waived for all papers submitted until the end of 2015. Follow @BJR_Radiology on twitter for the latest news and updates. Dr Giuseppe Guglielmi is a Professor of Radiology at the University of Foggia, the Casa Sollievo Hospital Scientific Institute in San Giovanni Rotondo in Italy and the Catholic University “Our Lady of Good Counsel” in Tirana, Albania. He is also a research associate with the Osteoporosis and Arthritis Research Group at the University of California, San Francisco in the United States. A musculoskeletal radiology specialist, with particular interest in metabolic bone disease, he is widely published and an experienced editor. Currently serving on the editorial boards of many of the world’s most respected radiology journals, including our very own BJR, his leadership will make BJR|case reports a valuable educational resource for the radiology community. Posted on April 22, 2015 by birblog2013. This entry was posted in Uncategorized. Bookmark the permalink.